Hayward is the number one best selling company for swimming pool equipment and parts. Hayward has been in business for over 80 years, they have always been the number one manufacturer when it comes to all of your swimming pool needs. Hayward not only ensures perfect product quality but they offer products that their customers can enjoy. Their products are made to last and when you take care of the equipment properly and have inspections and filter changes done at regular times your Hayward equipment is going to last you a very long time. Every time Hayward releases a new product, you can rest assured that the product will have the most advanced technology behind it. By using Hayward you will save money on the products as well as on operating costs as well. They offer everything you will ever need for your swimming pool. 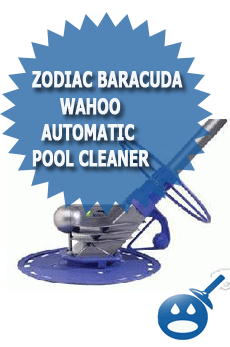 One of their premier products is the automatic pool cleaner. There are more and more of these cleaners on the market but they are not nearly as good as the Hayward inventory of pool cleaners. Here are some of Hayward’s best selling automatic pool cleaners, the Hayward TigerShark, Hayward Shark Vac, Hayward Phantom Turbo and the Hayward Viio Turbo. The Hayward TigerShark is best used for in ground swimming pools that are made from Gunite, Tile, Fiberglass and Vinyl. Some of the best features of the TigerShark is that it can actually figure out the size of the pool and then it can program itself to clean the pool with the maximum efficiency. It also can route it’s own cleaning patterns. The pump for the TigerShark can pick up dirt and debris as it is trolling over the bottom of the pool, steps, inclines and walls. It is also the first portable robot that features a reinforced cartridge filter element. The cartridge element is easy to clean, it removes with ease and all you have to do is hose it off. It really is that simple. The TigerShark uses a 24-volt safe motor that uses less energy and will give your pool the most efficient vacuum that you have ever had. The TigerShark now comes with a wireless remote control. The TigerShark is priced around $900 to $1000 depending on where you purchase the item from. 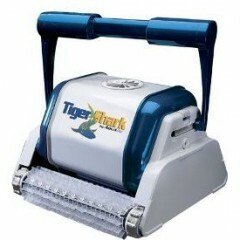 The SharkVac is one of the newest products under the TigerShark Brand. The SharkVac is designed for use for in ground swimming pools made from fiberglass, vinyl and gunite. There are 2 different models in the SharkVac Series; the RC9740 contains the SharkVac with a 110-volt, 24 VDC and a 50-foot cord. The RC9742 contains all of the above but it comes with a KD Caddy. 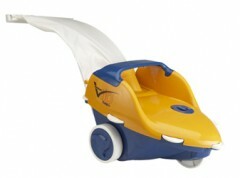 The SharkVac is a low cost machine that provides high quality service. It has Hayward’s QuickClean technology that makes the SharkVac capable of cleaning most size and shaped pools in as little as one hour. The SharkVac offers top access filters to allow homeowners to perform maintenance without any trouble. The technology that the SharkVac has is impressive, like the TigerShark it can figure out the shape and size of the pool and it can program itself to clean the pool quickly and efficiently. You will not need any additional hoses or extra equipment. 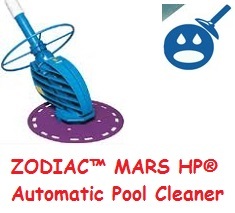 This new product fits right in with the other automatic pool cleaners; it is 100% reliable and dependable. It will clean your pool perfect every time. The Hayward SharkVac is approximately $800; prices will vary depending on where you purchase it from. The Hayward Phantom Turbo is one of the best selling automatic pool cleaners in the industry. It was designed for in ground pools constructed with tile, gunite, fiberglass and vinyl. The Phantom Turbo uses a special technology that guarantees better performance and improved efficiency. 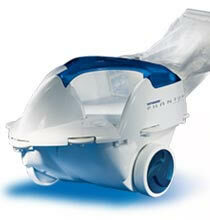 The Phantom Turbo can clean your entire pool in 3 hours or less due to larger nozzles and a more powerful sweep hose. The Phantom Turbo is capable of picking up larger debris through a larger designed suction inlet and three high-pressure water jets. Since the Phantom Turbo has a bigger cleaning bag so it doesn’t have to be cleaned as often. The Phantom Turbo has a programmable spin out that lets the homeowner to customize the chance-cleaning pattern that the machine decides to use. The Phantom Turbo is easy to install and unlike the other automatic pool cleaning machines, the Phantom Turbo requires a Booster Pump that must be purchased separately. The Phantom Turbo is priced around $ 700 but prices will vary depending on where you make your purchase from. 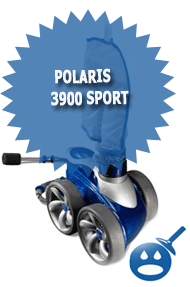 The Viio Turbo from Hayward is a high performance, high-pressure automatic pool cleaning machine. This model uses a 41% wider vacuum nozzle with a large debris bag. The Hayward Viio Turbo can be used for in ground pools constructed with gunite, tile, vinyl or fiberglass. The Viio Turbo has some impressive features, the Turbo has a special technology that was designed so the Viio Turbo can provide excellent performance, outstanding reliability and extreme efficiency. The Viio Turbo was designed to help with faster cleaning time. Engineers have created the widest vacuum nozzle and the most efficient sweephose. With this new technology, the Viio will pick up everything from dirt and big leaves to bigger debris such as acorns, pebbles and small sticks. The Turbo comes equipped with Hayward’s patented AquaDrive technology that lets the homeowner customize their own cleaning pattern, which can be matched up with their pool’s dimensions. The Viio Turbo’s AquaDrive is designed with water jet propulsion so it will not hurt the surface of the pool with the wheels of the cleaner. You may find that owners of other brands of automatic pool cleaning equipment may have had some troubles with the wheels wearing out the bottom of the pool. You will need a Booster Pump with the Viio Turbo Pool Cleaner but they are sold individually. 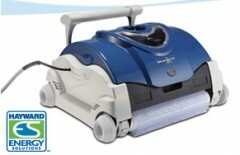 The Viio Turbo Automatic Pool Cleaner is priced starting at $450.00, prices may vary. Now that we have shown you what Hayward has to offer, their Automatic Pool Cleaners offer high quality cleaners made from the best materials and the most advanced technology. The prices are reasonable and not to mention that the pool cleaners are made by Hayward, the best in the swimming pool industry. It would be a good idea to shop around with Hayward and the other brands to see what company has the best pool cleaners best suited for your needs. Compare technical specs, features and prices and see if Hayward doesn’t come out on top most of the time. You can visit your local Hayward dealer which you can find on the Hayward website. You will find some great information as well as a picture of their products as well. Hayward is not just about quality products but they are also about customer service. If you have any questions, locate the contact us button on the website and feel free to ask any question that you may have. 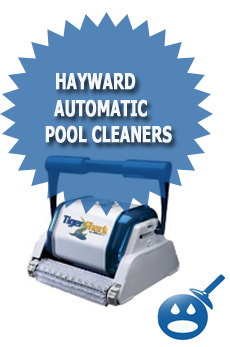 Next summer, check out the best in the Hayward inventory when it comes to Automatic Pool Cleaners, the Hayward TigerShark, The Hayward SharkVac, the Hayward Phantom Turbo and the Hayward Viio Turbo.